120,000 robotics patents have been published in the last 10 years, tripling in rate from 2004 to 2013, according to the UK Intellectual Property Office Informatics Team. Unsurprisingly, there was a huge drop in robotics patent applications in 2009-2010, although not all industries were as affected by the global financial crisis as robotics was. The preeminent country for robotics patents is Japan with 31% of patents published, the majority from Toyota. The US is in second place with 19%, followed by Germany (17%), China (10%), Korea (9%), France (3%) and UK at only (2%). Of course this is only an indication of the innovation activity occurring as some countries have greater propensity to patent than others. • energy and its storage. 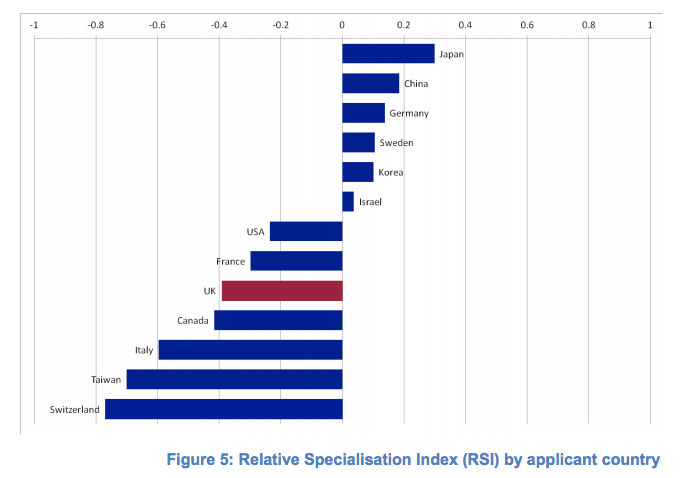 The IPO report also looks at the rate of robotics patents compared to other innovation patents on a country basis and creates a relative specialization index. Some countries such as Japan, China and Germany have proportionately greater robotics patents than general. 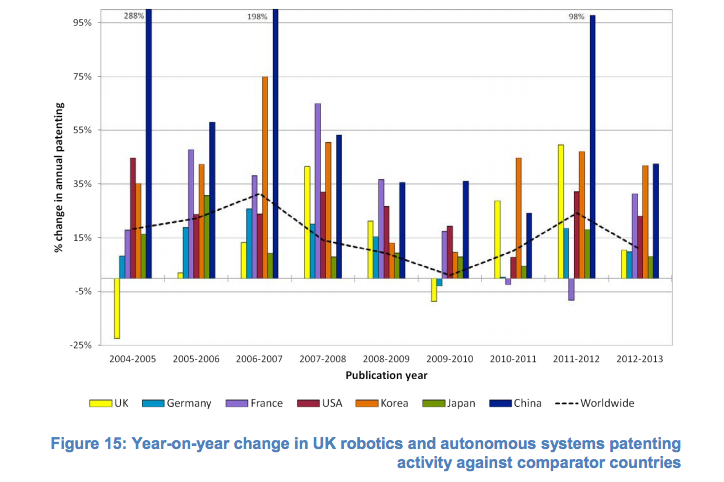 Whereas both the US and the UK are underspecialized in robotics technologies. 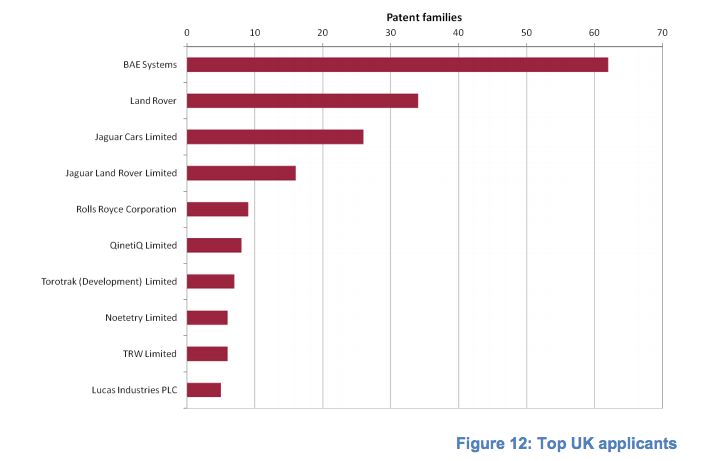 Overall, automotive patents make up around one third of the total, not including other types of vehicles such as trucks, buses, agricultural machinery, aircraft and aerospace/defence. Google’s automotive patent portfolio is relatively small, at 35 families. Most of Google’s patents were published very recently in 2013, with the earliest being only in 2010. The rate of publishing for Google shows clear increase so further patents should be anticipated. The report also shows collaboration within industry groups. For example, Google and Honda are very self contained in contrast to other automotive companies. 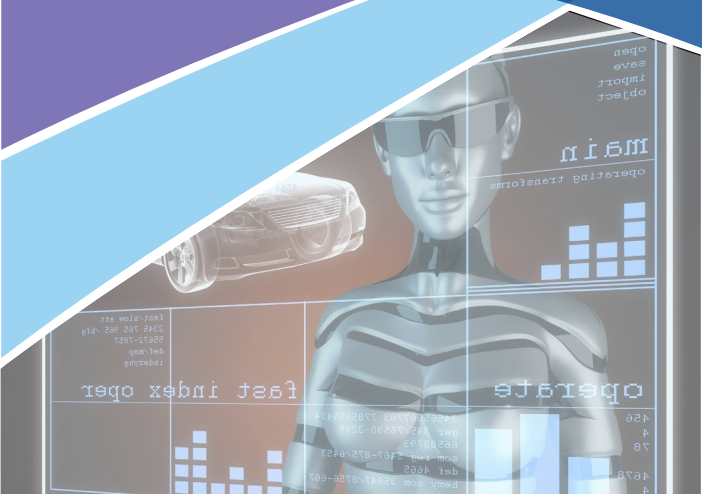 Most of the patents in the UK dataset are in the field of autonomous vehicles, including road vehicles, unmanned aerial vehicles, and unmanned underwater vehicles. Robotics companies in the UK dataset have very small portfolios, with the largest being Notetry (5 families), which is apparently a division of Dyson Ltd focussing on robotic vacuum cleaners. Other companies are Oliver Crispin Robotics Limited (industrial robotics), Absolute Robotics Limited (industrial robotics), Armstrong Healthcare Limited (robotics for surgeons), Isis Innovation Limited, QinetiQ Limited, and Rolls-Royce Plc. Finally, the rate of change in robotics patent publishing in the last 10 years is very interesting with China showing significant growth from a China to become one of the strong sources of inventions.